Imagine: A powerful app on your iPhone that logs your journey. 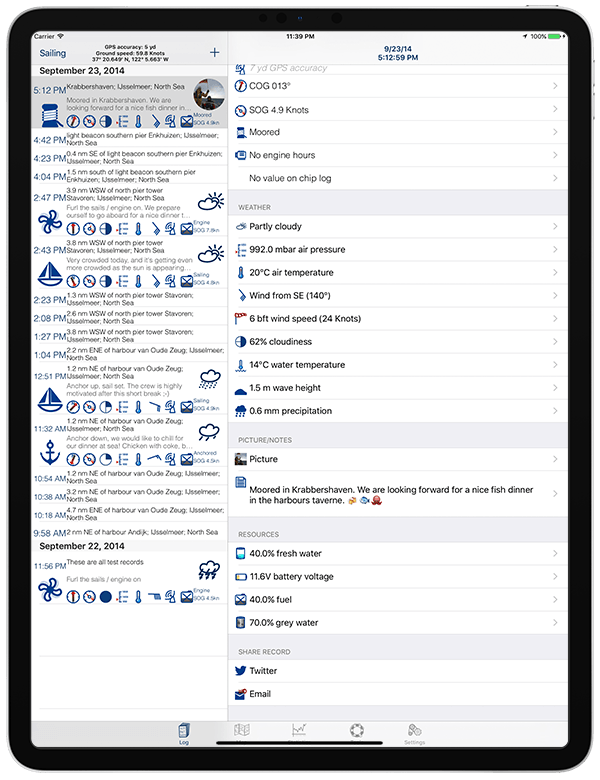 The Logbook app will write your logbook efficiently, better and easier than ever before. Why bother maintaining logbook records manually, when it can be done automatically? Not just for the pocket, also on a big screen at the navigation table incredible handy! ...takes the paperwork for you! Our credo "Writing the logbook should be fast and easy, preferably automated". And we are not stopping there. Lots of useful additional tools are available. Writing Logbook has never been easier before. Check out the extensive feature list and start to track your journey with Logbook today! Logbook supports the skipper to manage the vessel’s log. 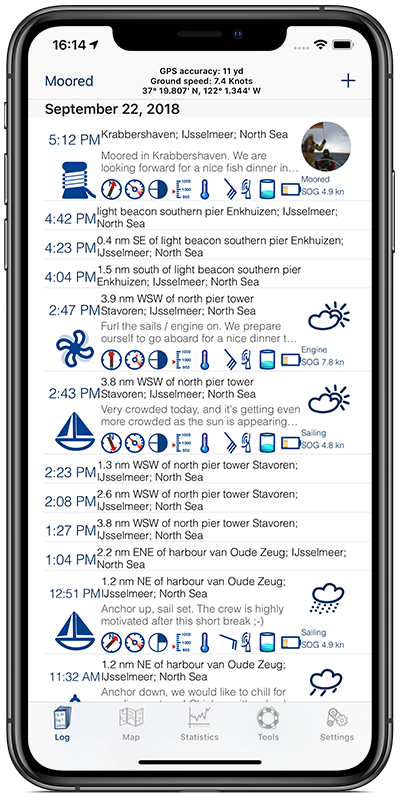 Common sailing activities happening on deck can be described in the log within seconds. Create statistics, for eachs ingle day, ot the entire trip. Sail summary just one fingertip away. Print your Logbook on paper or PDF. Export it into various data formats to show your track on Google Earth. Advanced users can export the raw database format using SQLite. Show your friends were you are. Everything is possible directly from your iPhone or iPad. With an average rating of 4.8 starts, I would like to thank you, as this helps to improve and develop the app even further. Also many thanks to all of you who provided constructive feedback which made the app as good as it is today!